The following are a sampling of case studies involving brand development that we have had the opportunity to work on with clients. These case studies demonstrate the level of strategic thinking and showcase the results of the brand development processes and tools used with clients. In 2005, Syngenta Seeds sought to enter the highly competitive corn traits market with their Agrisure line of corn-borer resistant (CB) and glyphosate-tolerant (GT) traits. While corn traits were the fastest growing category in corn production, Syngenta faced entrenched competitors Monsanto, Pioneer and Dow in its quest to gain a share of the growth. Late approvals on the trait products gave Syngenta limited time to launch before the peak hybrid-purchasing season. In addition, there was no opportunity to build awareness for the Agrisure brand name prior to launching. Consequently, there was no awareness of Agrisure in the marketplace. Additionally, a limited budget meant it was even harder for Syngenta to go up against trait giants YieldGard and Herculex with their virtual household-name familiarity. Market research showed that while growers loved the technology of traits, they didn't always love the providers of those traits due to restrictions and requirements they had to follow to use those traits. And that represented the opportunity for the Agrisure brand promise: To appeal to growers' need for technology, with no strings attached. Thus Agrisure was positioned as a new trait alternative, supported by "no penalty" risk management assurances, giving growers more freedom and decision control. The Agrisure launch campaign began with a national print campaign heavied-up with a national magazine cover wrap and regional radio to generate rapid awareness in advance of Agrisure sales calls. 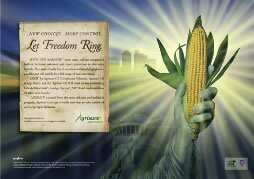 Additionally, special attention was paid to the seed companies that would be offering Agrisure traits to make sure they knew the Agrisure brand messaging and had the materials and comfort level to tell the Agrisure story to their customers. Finally, materials were developed to educate the sales force on the value of Agrisure and how it could help leverage sales efforts. Even with a limited budget at one-third of what the competitors were spending, Agrisure gained 5 percent unaided brand awareness and 20 percent aided awareness in just the first three months following the launch of the advertising campaign. Post-campaign, Agrisure corn traits were viewed as superior to YieldGard and Herculex for flexible weed control options, replant programs and fewer restrictions on glyphosate choice—reflecting the brand messaging. Growers also indicated increased intentions for planting hybrids with Agrisure traits in the following season, setting the stage for continued growth of share of mind and market that followed from the launch year. NK Brand is a member of the Syngenta Seeds family of seed companies, providing corn, soybean and alfalfa seed to North American farmers. NK Brand had undergone multiple mergers — and acquired many names — before joining the Syngenta family. Known as Northrup King when it began operations at the beginning of the 20th century, the company retained the NK initials. Yet years after the acquisitions and mergers, NK Brand customers still referred to the company by names from five, 10 and even 20 years before. The NK Brand Marketing Services team sought help to identify, solidify and clarify a market position and visual image for its brand. The goal was to create a strong, clearly differentiated brand that could help dispel the confusion created by past mergers and acquisitions. NK Brand also wanted a unique, ownable position in the marketplace that would position it for continued growth. Positioning work began with a marketing communications audit that included qualitative interviews with both NK Brand dealers and end-use customers. This review found a clear need for a strong brand positioning and identity that could be established and incorporated in all audience touchpoints, both internal and external, to communicate a consistent, on-target message. The NK Brand Marketing Services team was then led through a comprehensive brand definition exercise to articulate the brand. Team members provided input on NK Brand's image, personality, identity, promise and position. This information was developed in concert with a comparison and analysis of the other major players in the seed market. Armed with that position, a range of brand concepts were developed, suitable for use in a variety of mediums. The tagline "For the Way You Farm" was developed to embody the position of freedom and choice. These concepts, along with the results of the brand definition exercise, were incorporated into the Brand Shark Blueprint. This Brand Shark Blueprint became the definitive brand guide for NK's Marketing Services team, as well as the partners with whom they work. It provided brand and positioning terminology, along with graphics standards and image guidelines, to guide creative development for all brand touchpoints, from advertising and direct marketing to public relations and dealer communications. It helped integrate the NK Brand across all offerings and activities, and enhanced visibility and presence in the marketplace. Agricore United (AU) is a major supplier of crop nutrition and crop protection products to Western Canadian farmers and one of Canada's largest grain handling and marketing businesses. Created on November 1, 2001, by the merger of Agricore and United Grain Growers (UGG), Agricore United provides integrated grain, oilseeds, livestock and special crops marketing and handling services through a network of elevators and specialized processing plants. It also handles agronomic inputs, supplies and services through more than 200 retail outlets. With more than $2.5 billion in sales across several business segments and 2,500+ employees from two legacy companies, Agricore United faced significant challenges in creating and delivering a consistent brand promise. To intensify the challenge, past marketing communications efforts of the legacy companies were often handled independently among business units of crop nutrition, crop protection, seed, grain, investor services, member services and corporate services, with little reference to each other or regard for consistent messaging, look and tone. Market research was recommended to benchmark Agricore United's brand perception among its customer base. This market research enabled an Agricore United brand definition that spoke of customer focus, defined the grower customer as Agricore United's most important asset, and positioned them as a catalyst linking growers with value-added markets and end users. Next, the interaction between the master brand (Agricore United) and its associated sub-brands (Proven Seed, Agricore United Crop Protection, Agricore United Grain Merchandising, etc.) was mapped out. This exercise produced a sophisticated brand architecture and defined what the different units of Agricore United sold whereas the master brand defined how it was sold. Agricore United used this information to establish consistent, brand-friendly touchpoints with all of its customers. Finally, a creative blueprint was developed so all Agricore United personnel could measure their promotional activities against the brand strategy. The blueprint articulated the brand and brand strategy and became a template that could be held against any promotional element in development to determine its level of brand conformity. Agricore United established a clear voice among its grower-customers as well as its trading partners and end-use customers around the globe. Brand continuity helps ensure a consistent sales approach regardless of the communication. The brand also transcended specific communities with a consistent message, regardless of geography. Quantum Phytase from Syngenta Animal Nutrition is a next-generation bacterial phytase designed to improve monogastric performance. It is the first product developed and marketed by Syngenta Animal Nutrition, a division of global agri-business giant Syngenta. Syngenta Animal Nutrition needed help to position and brand Quantum Phytase for the highly integrated poultry market. Concurrently, the client also needed to position itself and generate awareness of the new player in the industry. Phytase had become a virtual commodity in the poultry industry, with most purchase decisions based on little more than price. "Phytase is phytase" was a common belief, and while most everyone used some phytase, few nutritionists could say for certain exactly what results they were seeing consistently. Furthermore, discussions on the value of phytase were limited to the bare bones of P availability and waste management. Research indicated Quantum Phytase was a breakthrough in phytase technology — with benefits beyond what had been realized before. The challenge became convincing poultry nutritionists around the world that phytase was not phytase, and that with Quantum Phytase, they could indeed expect more. Industry analysis revealed that players in the crowded phytase market were slugging it out by debating their thermo-tolerance and little more. Customer insight research revealed that nutritionists viewed phytase administration as more art than science. The thermo-tolerance of Quantum Phytase would need to be positioned as beyond question and, more importantly, as secondary to benefits above and beyond what was typically expected of phytase. The debate needed to be moved from simple P utilization to overall nutrient utilization, energy, consistency and performance. In essence, it was critical that the industry begin evaluating their phytase choices using a completely new set of criteria. The positioning for Quantum Phytase therefore focused on changing the way people thought about phytase. To make this message believable, the development of Quantum Phytase was emphasized, which, unlike the competition, utilized an enzyme that had been specifically selected due to its unique alignment with monogastric physiology. This inherently thermo-tolerant enzyme could, due to its superior fit with the target substrate, produce more consistent, efficient results without increasing dosage. Response to the Quantum Phytase position was positive. Field sales representatives reported increased interest in evaluating the overall results of phytase in feeding programs, complete with new challenges to other phytase manufacturers to present results beyond P utilization. Agriculture and Agri-Food Canada (AAFC) provides information, research and technology, and policies and programs to the nation's agricultural and agri-food producers. The department's mandate also includes increasing the sales of Canadian agricultural and food products abroad. Perceptions of Canada and its agricultural and food products are generally positive. Yet the country and its products suffered from low awareness in international markets. In addition, AAFC had little influence over the variety of marketing and promotional tools that were being employed by Canadian agri-food industry stakeholders in support of their own companies and products. This fragmented approach resulted in an absence of a cohesive Canadian agriculture and agri-food brand, as well as reduced export opportunities. AAFC needed to take the reins in, creating a consistent brand for Canadian agriculture and agri-food products. That brand would need to reinforce existing positive perceptions about the country and its products, but could not constrict future opportunities created by changing consumer and market trends. Additionally, to succeed, the brand would require buy-in from a myriad of governmental and private bodies with a range of objectives. Working with AAFC, one of the first steps was an evaluation of current marketing tools, focusing on content, usage, consistency and messaging, along with effectiveness in an increasingly competitive and sophisticated global market. The results of this analysis pointed to an exciting opportunity to develop new, more effective materials. The next step towards that was a brand definition exercise with key stakeholders. With buy-in secured from these stakeholders, and a great deal of consultation and facilitation, the team was able to define and document a brand promise for Canada's agriculture and food products sector. That promise not only built upon the positive consumer perceptions of Canada and its agricultural products, but also incorporated key benefits sought by customers. The promise also highlighted the competitive advantage of each of the major sub-sectors — beef, pork, seafood, cereal grains, oilseeds, special crops and horticulture — relative to key competitors. Finally, a clearly defined promise set the stage for development of a logo and consistent brand look and feel for Canadian food products that addressed the functional, social and even emotional benefits of those products. The new umbrella brand for Canada's agriculture and food products represented significant collaboration among a multitude of stakeholder groups. It also provided a blueprint to ensure that any new marketing materials, whether by sector or individual companies, delivered a consistent, clear and strong message about Canadian food destined for international markets.